Sri Chamarajendra Samskrita Graduation and Post Graduation Centre is one of the oldest Sanskrit colleges in the state. It was established as ‘Vaani Vidyashaalaa’ in 1885, with the collaboration of the Education department and many Sanskrit lovers. It used to impart education in Alankara, Veda, Yoga and various shaastras. It was renamed as ‘Vaani Sanskrit College’ in 1889, and an administrative council was set up to ensure availability of better facilities for study. The college got a new building, and a new name as ‘Sri Chamarajendra Sanskrit College’ in 1896. It developed with the monetary help received from the Mysore court, and also various mutts. In 1924, the Veda department was separated as ‘Sri Chamarajendra Veda Mahapathashala’, and remained under the control of Mujarayi department, while the Shaastra departments were taken over by the Education department of Mysore government as ‘Sri Chamarajendra Sanskrit college’. Around 1940, the then Dewan of Mysore, Sir Mirza Ismail, helped the college to acquire it’s own building in the present location at Pampamahakavi road, Chamarajpet. A beautiful building was constructed in the spacious 300×200 site, with monetary help from the Government. Study of Vedanta (Advaita, Dvaita, Vishishtadvaita and Shaktivishishtadvaita) commenced in 1948. Jainasiddhanta was also included in 1955. At the same time, a syllabus of study for 13 years, encompassing Prathama, Kavya, Sahitya, Vidvanmadhyamaa and Vidvaduttamaa was established. Annual examinations were conducted by a board through eminent scholars, and respectable citizens. The Veda Mahapathashala was separated from the Mujarayi department and re-merged with the Sanskrit college, and it remains that way today, being an esteemed centre of learning for both Vedas and Shastras. Illustrious alumni of the college – Sri Sri Sri Balagangadharanatha Mahaswami(Adichunchanagiri math), Belimatha Shivarudraswami, Koladamatha Shantaveera Mahaswami, Vid. N T Srinivasa Iyengar, Vid. N Ranganatha Sharma, etc. Shaastras – Alankaara, Vyaakarana, Naveenanyaaya, Advaita vedaanta, Dvaita vedaanta, Vishishtaadvaita vedaanta, Shaktivishishtaadvaita vedaanta, Jainasiddhanta. 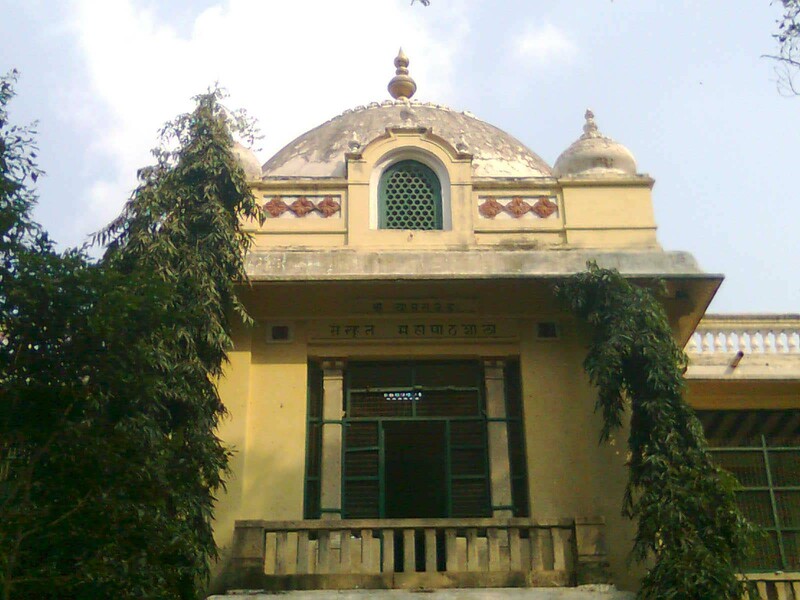 The college contains a well-equipped library named ‘Vani Samskrita Bhandaara’. The library houses over 8500 books, mostly donated by the Royal family of Mysore, and various citizens of Bangalore. There is also a boys’ hostel which provides free accomodation and food to students. The college is located in a central location in the capital city of Bangalore, very close to K R Market bus-stand.